I think we can safely say that, even in my short life as a blogger, I have established my love for Asian flavors. The strange thing is, I don’t like ginger in any other guise – not in candy, not in drinks, not in cakes or cookies – but put it with some meat and a few vegetables and I’m singing it’s praises. This soup is as near to a weeknight staple as we get in our house, meaning we have it more than once a year. We don’t tend to have the same thing over and over again, although if I discover something really good we might have it a few times in the initial excitement, but it soon levels out to once every few months. I guess that’s a good thing, it means that I’m constantly looking outside of my repertoire for something new and different, but it’s always nice to come back to something you know you will enjoy and can make without thinking. 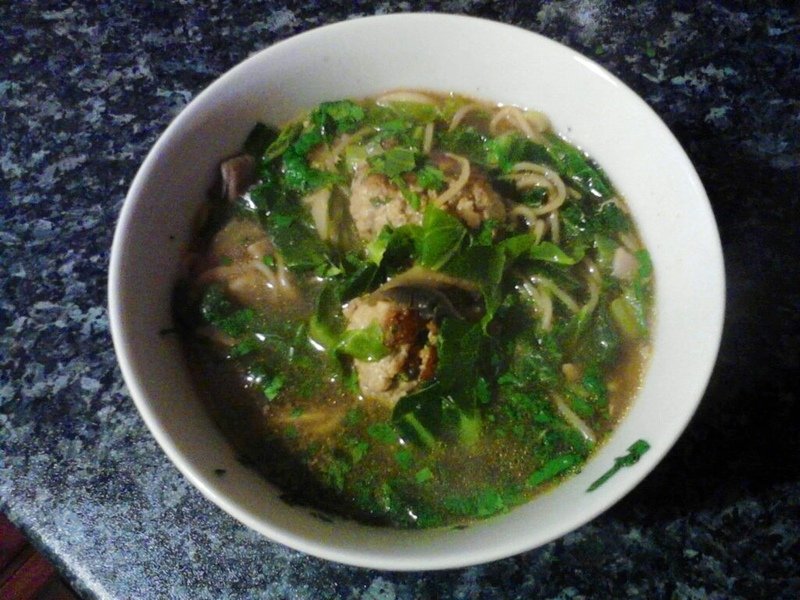 This recipe is another from Olive magazine and is a pretty basic broth with pork meatballs sporting chilli, ginger, garlic, spring onions (green onions or scallions) and soy sauce. Sometimes I throw a little Chinese five spice in for an extra hit of flavor, but the most important thing is to make sure you season the meatballs correctly because it will seriously let the soup down if the meatballs are bland – and, yes, even with all those punchy flavors, they can still come out bland. You don’t need any eggs or breadcrumbs in the meatballs, but this means they do come out a bit soft until you cook them, so no man handling! I usually make the meatballs and fry them in a bit of sunflower oil in the same pot I plan to use for the broth – no waste of flavor and no unnecessary dirty dishes! The broth is just chicken stock with a few tablespoons of hoisin sauce mixed in and I usually throw in a few thick slices of ginger and leave them to impart their flavor as the broth cooks. Another good addition would be star anise, coriander (cilantro) stalks and/or a chilli (split or pierced) depending on how spicy you like it. As far as vegetables are concerned, add what you want. The original recipe calls for sliced mushrooms and Chinese leaf (which I think is just Chinese cabbage), but any sort of greens or cabbage will do (except spinach which I think might be too delicate for this). Usually I use what are called ‘spring greens’. They are cheap and relatively robust, not to mention delicious and British produced which is always good. 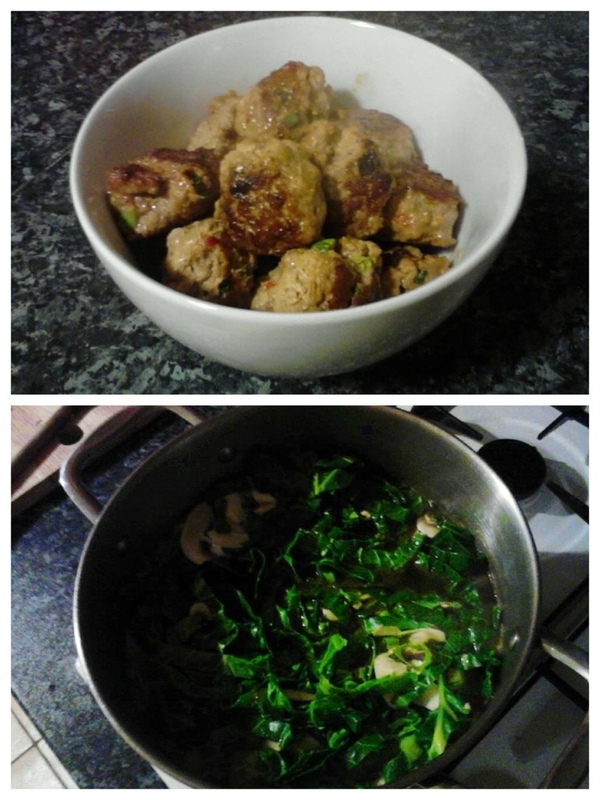 Once the stock is boiling, chuck in the already fried meatballs and the vegetables and cook for about 5 minutes until the mushrooms are soft and the greens are wilted. You want to make sure you have enough stock to cover everything. At this point, I usually add some noodles – most often the stir fry variety which are cooked and just need to be heated through and of these udon is definitely the best and most satisfying for this dish – but they inevitably get overcooked and by the next day they are pretty much completely dissolved, so if you were thinking of enjoying leftovers, think again! In an attempt to remedy this I have started cooking the noodles separately if necessary – pouring boiling water over them and letting them soak for a few minutes if I’m using dried noodles – and just putting them in the individual bowls to them be heated through by the soup when it’s ladled in. So far this has worked well and has stopped me ending up with a bunch of dismembered noodles in the bottom of my bowl on day two.